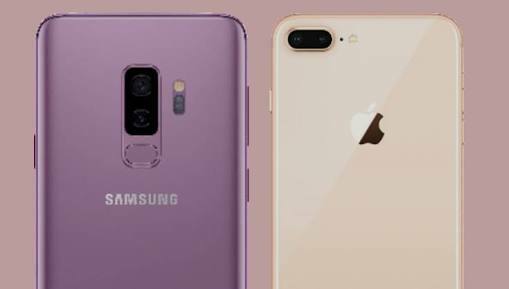 Samsung Galaxy S9 Plus VS iPhone 8 Plus: Which Plus version is better? Samsung Galaxy S9 Plus VS iPhone 8 Plus: Which Plus version is better? After the iPhone 8 battled the Samsung Galaxy S9. It is only right that their Plus version battle each other too. Apple and Samsung are the leading phone manufacturing company in the world. Their rivalry will see each side try to produce the best smartphone in the market. Let’s compare the features and specifications of their latest “Plus” flagship. The iPhone 8 Plus is arguably one of the heaviest high-range smartphone out there. It weighs a surprising 202 grams. The Samsung Galaxy S9 Plus comes close, with a weight of 189 grams. Despite its weight, the iPhone 8 Plus is slimmer than the Galaxy S9 Plus. It measures 7.5mm in thickness. With the Galaxy S9 Plus at 8.5mm thickness. Samsung Galaxy S9 Plus offers 4 different colors (Midnight Black, Coral Blue, Titanium Gray and Lilac Purple). While the iPhone 8 Plus comes with Apple usual Gold, Space Gray and Silver colors. Both phones body are covered with glass front and black, enclosed with metal. Aluminum for the Galaxy S9 Plus and stainless steel for the iPhone 8 Plus. The Galaxy S9 Plus and iPhone 8 Plus are both water/dust resistant. Though the Galaxy S9 Plus with a better IP rating than the iPhone 8 Plus. The dual rear camera of the iPhone 8 Plus is at the top-left corner in horizontal angle. While the dual rear camera of the Galaxy S9 Plus is at the top-middle but in vertical angle. Like the Galaxy S9, the Plus version is also bezel-less with a 84.2% screen-to-body ratio. While the iPhone 8 Plus comes with a base model with a 67.4% screen-to-body ratio. Game or movie lovers who prefer bigger screen size would want the 6.2-inch Galaxy S9 Plus. The screen size of the iPhone 8 Plus is just 5.5 inch. The Galaxy S9 Plus sport a super AMOLED screen with a resolution of 1440 x 2960 pixels and 529 ppi density. While iPhone 8 offers IPS LCD screen with resolution of 1080 x 1920 pixels and 401 ppi density. The AMOLED technology offer brighter and sharper display than the IPS LCD. And with Apple’s iPhone X having the AMOLED screen. We can be sure the iPhone 8 Plus and iPhone 8 will be the last Apple phone with IPS LCD screen. Both device have the fingerprint sensor, while the Galaxy S9 Plus offers more with Facial recognition and Irish scanner. Not sure you’ll get a smartphone with better camera quality like the Galaxy S9 Plus. On the rear side, the Galaxy S9 Plus has a wide-angle lens with a 12MP f/1.5 aperture and a telephoto lens with a 12MP f/2.4 aperture. While the iPhone 8 Plus comes with a dual rear 12MP f/1.8 aperture + 12MP f/2.8 aperture. On the selfie/front camera, the Galaxy S9 Plus offers better mega pixel and aperture. It has a 8MP f/1.7 aperture while iPhone 8 Plus has 7MP f/2.2 aperture. The iPhone 8 Plus comes with the best chipset, the Apple A11 Bionic with Hexa-core processor. While the Galaxy S9 Plus is beinh run by Qualcomm Snapdragon 845 chipset with Octa-core 2.7GHz processor. They both run on their latest operating system. Android 8.0 Orea for Samsung Galaxy S9 Plus. And iOS 11 for iPhone 8 Plus. Samsung boost the Galaxy S9 Plus with a 6GB RAM, putting it in the same league with phones such as “One Plus 5T” and “HTC U11”. The iPhone 8 Plus comes with a 3GB. Both smartphones offer 64GB and 256GB ROM. With Galaxy S9 Plus having an additional 128GB ROM model. Apple always comes up short when it comes to battery. And am not surprised to see the Plus version having just 2,691 mAh battery capacity. While the Galaxy S9 Plus comes with a reasonable 3,500 mAh battery capacity. The iPhone 8 Plus goes for about $995 (N348,250). While you can get the Samsung Galaxy S9 Plus for around $1,220 (N427,000). The Galaxy S9 Plus is more expensive. But considering what it has to offer with that of iPhone 8 Plus. I say Galaxy S9 Plus should be the choice, that’s if there’s no financial constraint. Jumia Kenya |from Ksh3,530 !